So you’re planning a trip to Bali! You’ve looked at countless blogs and Instagram photos of the island of Bali and all the amazing sights waiting for you to discover! Perhaps you’ve been to Bali on holiday a few times but are looking for a new way to immerse yourself in some sights, senses and experiences. The best way to do this is to rent a scooter or a motorbike and here are four reasons why you’ll be glad you did! ❖ It’s a great way to enjoy Bali. You’ll be able to adventure off the beaten track and navigate the intriguing narrow streets across the island, visiting sights that most tourists don’t have the privilege to see. ❖ You have a great deal more freedom when exploring the island by motorbike or scooter. You’re not bound to a tour group and because it is possible to ride a motorbike to almost anywhere on the island this means that you can really tailor your trip to suit your precious holiday on Bali. ❖ Riding a motorbike will save you a lot of time. In Bali there are often a lot of traffic jams; couple this with the narrow roads and you’ll find moving around from A to B in a car can be very time consuming. If you only have a short time on the island, a motorbike will give you the opportunity to zip around the island, bypass traffic down narrow streets and fit in more Bali sights in a fun, efficient way. ❖ Riding a motorbike in Bali is the most cost effective form of transportation, costing only around USD $3 to fill up your tank with petrol on a standard scooter or motorbike. All in all, riding a motorbike or scooter on Bali is a great way to activate all the senses during your adventures! You’ll feel the wind in your hair, you’ll experience all the sounds and smells of this beautiful island up close. Convenience - How easy is it to organize your rental? You probably don’t want to arrive on Bali and waste precious holiday time searching for a reliable motorbike rental company. Many of the motorbike rental companies don’t provide credit card facilities, meaning you’ll have the added mission of withdrawing money, they take your passport in escrow and there is no insurance and so on. You will be better off choosing a motorbike rental company that allows you to pre-book your bike. For example, at BaliBikeRental.com you can conveniently place your order online using any of the major credit cards such as VISA, Master Card or even PayPal. Your bike(s) will be delivered and waiting for you upon arrival at your Bali accommodation. Safety & reliability - Are the bikes you are renting in top condition? You don’t want to end up renting an old scooter or motorbike that is going to break down or give you issues during your holiday in Bali. Also ask about roadside assistance, is it available 24/7/365? If there is an emergency you will want to speak to a person, not an answering machine! Check if there is motorbike insurance available so you don’t have to worry about the high costs involved in the event that your motorbike gets damaged or stolen. Driving license support - You will actually need an international driver’s license to ride a scooter or motorbike in Bali. Instead of adding this to your long list of “thing to do” before you travel, choose a company that will assist you with organizing an international license. Bali Bike Rentals can help to get you one prior to your arrival or once you have arrived in Bali. Unique add-ons - Choose a rental company that will provide you with add-ons to enhance your travels around the island. For example BaliBikeRental.com offers additional accessories such as Pocket Wifi so you can enjoy coverage all over the island and make use of Google Maps on your smartphone. Selfie sticks and GoPro helmets, power banks and travel adaptors and first aid kits are all available to rent as additions to your motorbike. 1. In Bali they drive on the left hand side of the road but also be sure to drive on the left hand side of your lane as much as possible. 2. Always wear a helmet and make sure it’s the sturdy kind. Your rental company should provide you with reliable, safe and clean helmets. If you do not wear your helmet you run the risk of being heavily fined by police who may pull you over. 3. Keep some cash on you for bribes, in the event you do get pulled over. A good tip is to carry two wallets, one with most of your money and a separate one for ‘bribe money’ that you carry on your person holding around IDR 100 000 in 20k bills (approximately USD $10). 4. Wear bright clothing, particularly if you are riding in the evening. 5. Don’t ride with more than one passenger, you may see a lot of locals doing it but it is not advised. 6. Watch out for Bali intersections. They are busy and there are lots of other bikes and cars on the road. Remember that if a vehicle is bigger than yours, it has right of way, so be sure to yield. 7. Use your horn when coming up to a blind curve; you’ll want to alert anyone coming around the bend that may be driving in the middle of the road when approaching the curve from the other side. 8. Don’t drink and drive. Alternatively, hire from a company that will offer a service to locate and bring your bike to you, in the event you’ve had too much to drink and need to take a taxi home instead. BaliBikeRental.com offers this service at a low rate of USD $35. And last but not least, enjoy your adventures! Renting a bike is really the best way to get around the island and experience all it has to offer. 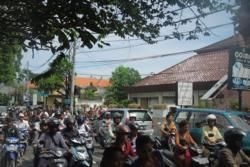 Check out www.balibikerental.com for more information on renting a bike for your next visit to Bali.